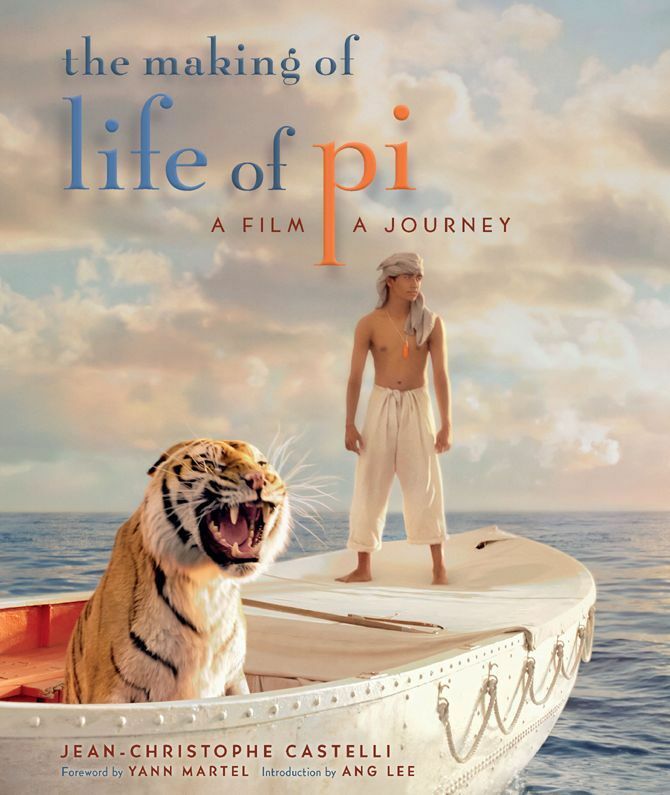 Article first published as Book Review: The Making of Life of Pi – A Film, A Journey by Jean-Christophe Castelli on Blogcritics. Life of Pi, director Ang Lee’s Golden Globe-nominated adaptation of Yann Martel’s 2001 novel of the same name, is a striking technological achievement. The film is pitched somewhere between realistic survival epic and speculative fantasy. Partly due to being a hybrid of these polar opposite genres, Life of Pi offers the relatively rare opportunity to see something cinematically unique. Not content with mere visual flash, however impressive it may be (particularly in 3D), Ang Lee and screenwriter David Magee were sure to retain much of the ponderous philosophizing of Martel’s novel. Jean-Christophe Castelli has written a detailed account of the film’s production, The Making of Life of Pi: A Film, A Journey, now available from Harper Design. Castelli has a history of collaboration with Ang Lee, having worked with the director on both Sense and Sensibility and The Ice Storm. In addition, he served as an associate producer on Life of Pi. This intimate involvement with the production of the film made him an ideal candidate for penning this account. The book is divided up very logically into four sections. The first, “Charting the Course,” traces the film’s development. Anyone familiar with film is aware of the framing device that bookends the story of Pi’s sea voyage. Among the interesting bits that Castelli documents is Lee’s decision to utilize a rather unorthodox split-page screenplay format. Lee had sections of the screenplay formatted with the present-time (involving the adult Pi) script elements running down the left side of the page, with the flashbacks (involving the young Pi) running down the right. This kind of attention to all manner of production detail is what makes the book valuable for fans of the film. “Setting Off” charts Life of Pi’s pre-production period. This includes casting, something that is particularly fascinating for a film of this nature. The teenager who played Pi during the bulk of the film, Suraj Sharma, was completely inexperienced as an actor prior to being cast. Not only is the discovery of Sharma (who delivers a truly extraordinary performance) discussed, but also that of the tigers that portrayed Pi’s companion. 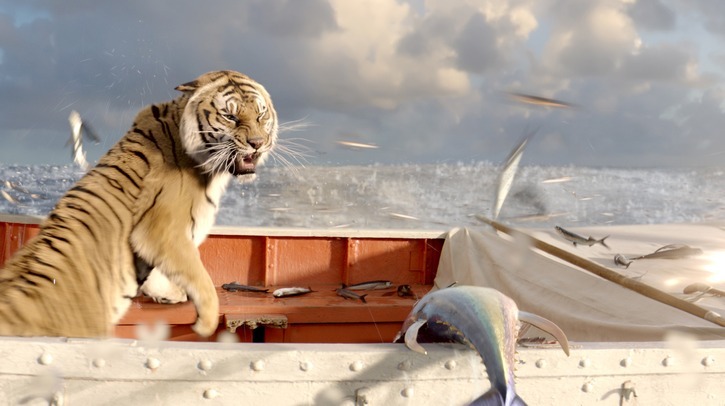 In a mostly seamless melding of CG imagery and live-action footage, no less than four tigers were used for the single character of Richard Parker, the improbably-named Bengal tiger who survives the sinking of Tsimtsum. With photos depicting the various stages of computer wizardry employed for the tiger scenes, there is a great deal of revealing info dealing with the Richard Parker character. During “The Journey,” which examines the actual production of the film, and “Reaching Shore,” which explores post-production, seemingly no stone is left unturned. It was a wise decision for Castelli to not limit the scope of his book to visual effects. Of course, as with the tiger, it’s hard to tell in many cases where the practical elements end and computers take over. I had no idea while watching the film that the swimming pool which Pi was named after, the Piscine Molitor, was a real pool in Paris that still exists (though it has long since been closed). It seemed like the kind of purely whimsical creation we’ve seen in Wes Anderson movies. The book provides both vintage and modern visual references as it discusses the celebrated pool. While there’s plenty here for the most casual admirers of the film, Castelli’s text is agreeable, making for a breezy read. The many images, including candid production shots, storyboards, and conceptual art, make this effective purely as a picture book. But it wasn’t written from the perspective of an outside observer. Castelli’s access to the film’s primary creative minds allowed him to acquire a large amount of exclusive interview material. He conveys the story of the film’s production thoughtfully. Life of Pi novelist Yann Martel contributes a thoughtful foreword to The Making of Life of Pi: A Film, A Journey. Martel offers a compressed history of his experience writing the novel and the life-changing career move it became. 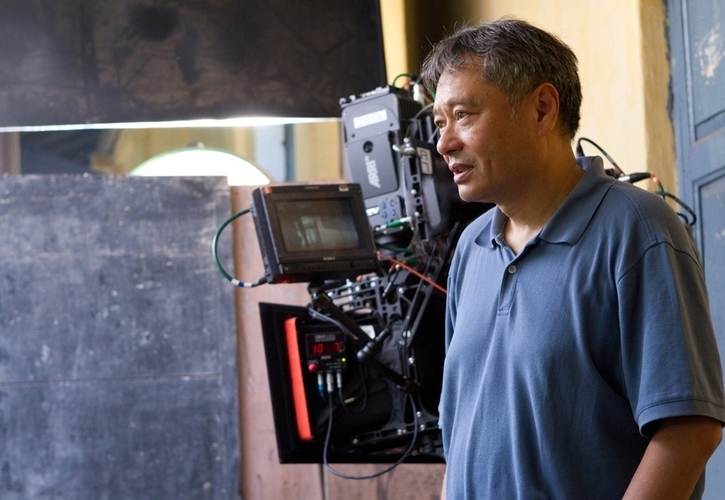 Director Ang Lee penned the book’s insightful introduction. Though relatively brief, these introductory pieces by those who are arguably closest to the material (no contest regarding Martel, the third member of this party—heavily included in section one—is screenwriter Magee) add significant value to this authorized account. In addition to hardcover, The Making of Life of Pi is also available in eBook format.